The electricity produced by the solar energy project is projected to reduce the library’s electric costs by 12 percent annually. Brentwood, NY - February 19, 2014 - The Brentwood Public Library's new photovoltaic (solar power) system, the largest solar panel installation for a public library in New York State, was completed this January 2014, PSEG Long Island LLC, selected by the Long Island Power Authority (LIPA) in Dec. 2011 to manage LIPA’s electric system, provided a $225,000 rebate through its Solar Entrepreneur commercial renewable program, which was used in the creation of this eco-friendly project. “This is a good example of how an educational institution can work together with a major utility and the New York State government to provide cost effective operations,” said Brentwood Public Library Director Tom Tarantowicz. The library is now benefitting from solar power by generating its own electricity to help offset electric utility costs. The electricity produced by the solar energy project is projected to reduce the library’s electric costs by 12 percent annually, and during its 30 year estimated lifetime the system will produce $1.2 million of clean, renewable electricity. Over the past few years, the library has instituted many cost-saving methods to reduce energy consumption such as the changeover to more efficient lighting and updating of the heating and air conditioning system. The solar power installation which was designed by Beatty, Harvey, Coco Architects and implemented by McClave Engineering is their most ambitious and cost effective project to date. 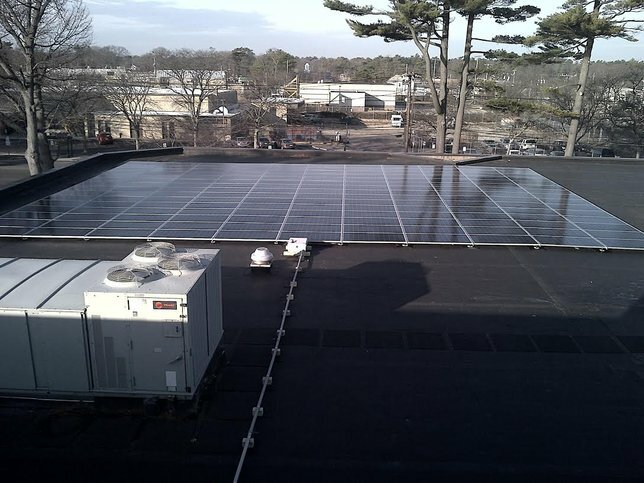 Long Island contractor SUNation Solar Systems completed the solar project on time and on budget. “As one of the oldest and most reputable solar firms on Long Island, our commitment to energy independence was in perfect synergy with the Brentwood team,” noted Scott Maskin, president of SUNation Solar Systems. For further information about the Brentwood Public Library’s new photovoltaic system contact Marie Weiss at 631-273-7883 or SUNation Solar Systems at 631-750-9454. Subject: LongIsland.com - Your Name sent you Article details of "Brentwood Public Library Completes Largest Solar Panel Installation for a Public Library in New York State"